My purpose is to “invite others to come unto Christ.” 1 This is your purpose too. We can fulfill this purpose by looking up to Jesus Christ. "Never permit yourself to become a weak link in the chain of your generations". That's such a simple statement, but it's so true. The best way that we can help share the gospel of Jesus Christ is by living it ourselves, and if we want to help as many people as we can, we need to make sure that we are always strong in the gospel. How can we make sure we aren't a weak link? We can go back to the basics that we've always been taught - read scriptures daily, pray often, always attend church (and actively participate!! ), serve others, obey the words of the church leaders. Elder Choi's advice in this conference talk was to focus on the Savior. Don't focus on the things around us, but on the Savior. 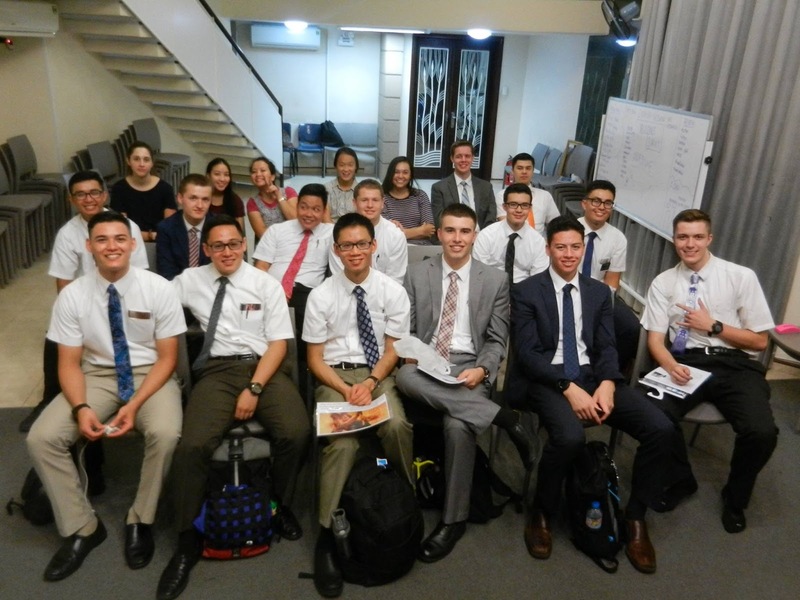 Elder Choi said, "Do not lose your faith because of the people around you, but build a strong relationship with Jesus Christ. Don't look around, look up!" If we focus on what other people are doing, it's really easy for us to get distracted or fall away from what Heavenly Father really wants us to be doing. But if we focus on the Savior and on the things that He wants us to do, then it will be easier for us to focus on the things that truly are important. And with that, what important things happened this week? 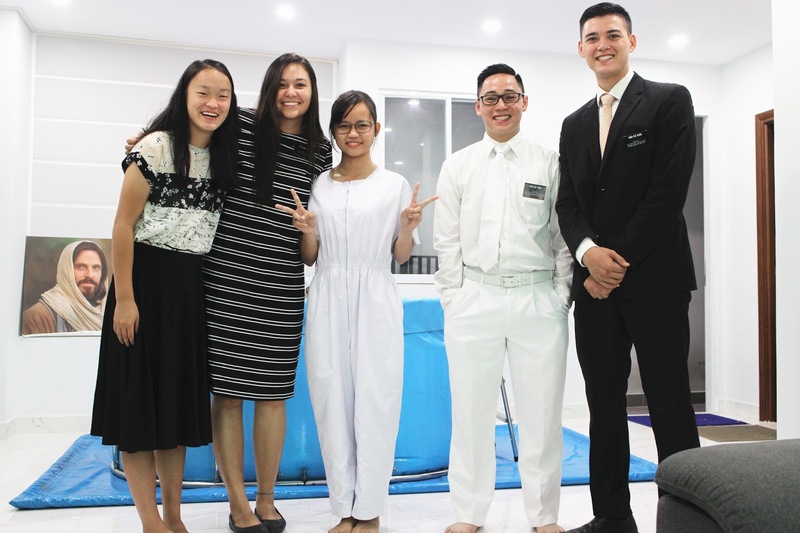 Our investigator, Em Nguyen, got baptized! She is the cutest little girl ever, only 18. Funny thing too, I've met her aunt who lives in America! 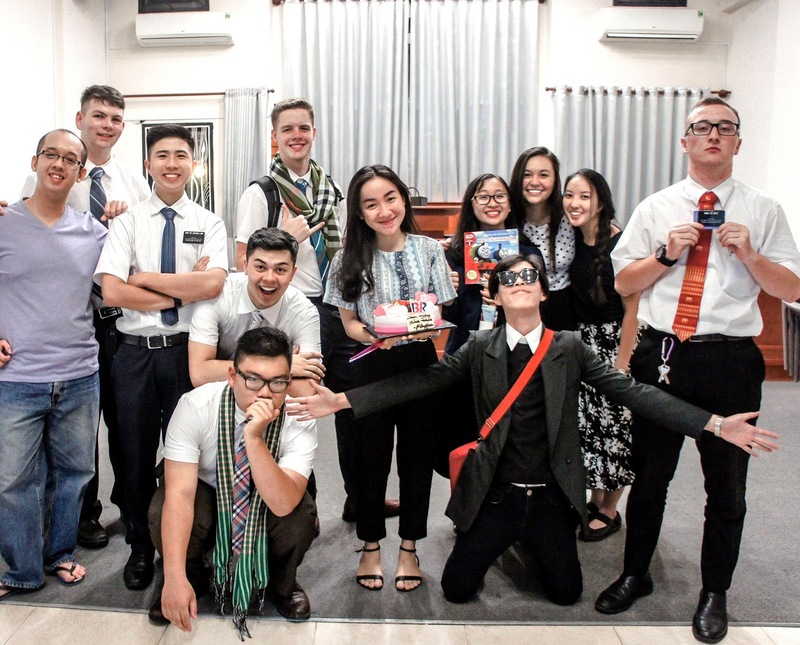 When I was in the MTC, President and Sister Hassell came to visit our district because of the New Mission Presidents Conference, and they brought Em Nguyen's aunt along with them! Her baptism was awesome. We also got a new investigator, Hanh! When I served in Tan Son Nhat, Chi Chau and I were introduced to a new student that showed up, named Hanh. She had really liked the spiritual thoughts, and so after class the elders were able to give her a Book of Mormon! Unfortunately on that night we didn't get an appointment set up with her to help her learn more. BUT after I got transferred, the elders in Tan Son Nhat were able to set up an appointment and start teaching her! And then the cool part is, she ended up being part of the District 6 branch boundaries, which means now Chi My and I get to teach her! It was so awesome to see how Heavenly Father lined everything up like that. She is AWESOME, she is super smart and loves learning about the gospel. The quote from this week, once again, comes from chi My. Just last night when we were going to bed, she rolled over and said, "Chúc ngôn ngữ!" The direct translation for this would be: "Wish you language!" She meant to say, "Chúc ngủ ngon!" which means, "sleep tight!" but just mixed up the words, hahaha. She's so stinking cute! Thanks for all the emails and updates! After all the effort I put in to make up the analogy with durian, it backfired in my face. This past week I was forced to eat during for the first time. But, on the plus side, I now know for sure that I will never ever eat durian ever again because it really is as bad as everyone says it is. 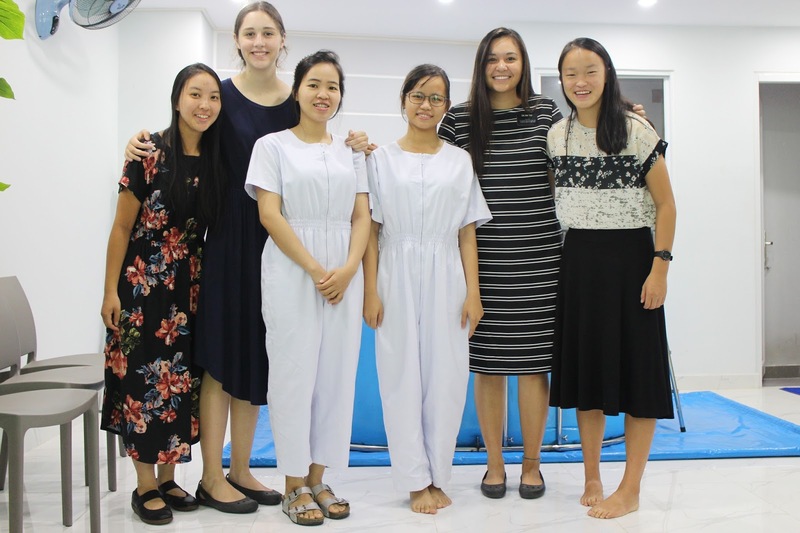 So this week I was asked to go back to my old area to serve with chi Thuy An - she's one of the new sisters who went to the Philippines MTC and chi Chau was her trainer. Chi Chau went out to Hong Kong to renew her Visa, so I came back to helped chi Thuy An out with the Tan Son Nhat area. It was super weird to be back, but also a lot of fun. I was able to see all of our old investigators and the members that I used to go to church with! The best part was that I was able to go to church in Thao Dien as well and see Co Huong and Chi Thanh get confirmed! Sister in the striped shirt is from Vietnam and served in Cambodia. Sunday really was the best day of my week, as usual, but this Sunday was extra special! Why? One of our recent converts who was baptized a while ago hasn't been coming to church. It's been really sad and frustrating and we were running out of ideas as to what we can share with her to help her come back to church. She loves reading her scriptures, praying, meeting with the missionaries, but she's never able to come to church on Sundays because of outside pressure from family/boyfriend. BUT, this past Sunday, she came to church and stayed for the whole time!! Heavenly Father knows exactly what we need. And most of the time, He knows the things that we need even though we didn't know we needed it! (that sentence makes sense in my head). When I got asked to return to my old area for a week, I didn't think too much about it. To me it wasn't anything special, it would just be a normal week. But Heavenly Father knew how much I needed to come back to this area. Not that I would help anyone any more than the other sisters would, but it was just something that I personally needed. I was able to see some of the investigators and recent converts that I didn't get a chance to say goodbye to, I got to witness Co Huong and Chi Thanh get confirmed (which was awesome because I missed their baptism), and I got to be there at church when our recent convert finally came back! Heavenly Father knew that I needed to reunite with all these people, witness these things, one last time before going on to a new area, because He knew how happy it would make me. He knows all things, and He always knows what's best for us - even if we don't realize it! All in all, this week was a really good, fulfilling week. Thanks for all the emails and updates, as usual! In vietnamese, "chia tay" is a way you can say "breaking up". And our district (which is the smaller version of a stake) is BREAKING UP. We officially have 2 WHOLE DISTRICTS IN VIETNAM!! One in Hanoi, one in Saigon. SO EXCITING. The most exciting part is that now on our teaching records, we can actually write something different and not just write "Hanoi District" every time we get a new investigator. Now I can write "Saigon District", and that's the best part of it all. In addition to the new district, 3 new branches were created! So in total, we now have 10 BRANCHES in all of Vietnam! When i first started serving here in July 2016, we only had 3: One in Hanoi and 2 in Saigon. Now we have TEN. The growth of the church here in Vietnam has been amazing! In just a year I've seen so many changes. If we keep going at this rate, we'll have a temple here in no time! 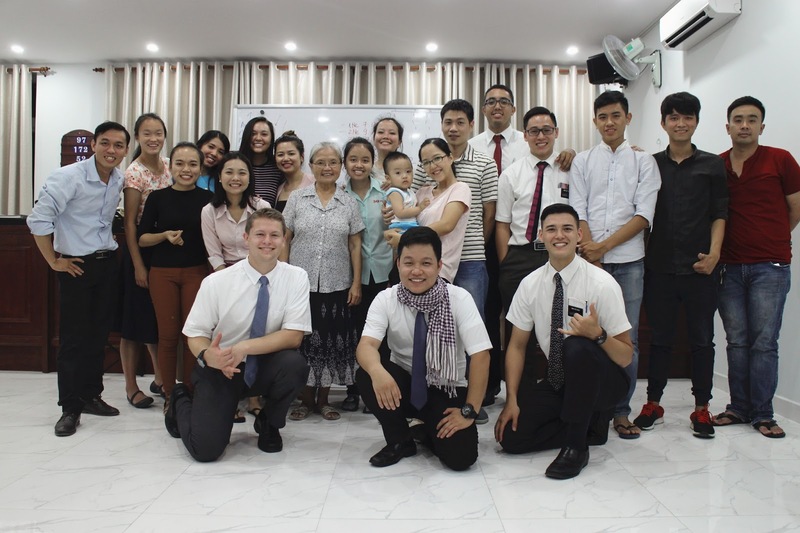 This past saturday, we were able to have a lesson with one of our investigators who has been taught by almost all the sister missionaries in Vietnam (she just keeps moving houses). She asked one of the best questions ever: "Ý kiến đó là của mình hay là ý kiến đó đến từ Thượng Đế?" (Was that just my idea or did that come from God?) That is one of the questions that tons of members of the church ask themselves: Was that just me thinking or is God trying to tell me something? Our response to her? Pray about it. Pray about whatever it is, and then ACT. Heavenly Father is ready and willing to give us guidance and answers, but it requires some action on our part. We can't just sit there and think, "Ok Heavenly Father, I'm ready. What do I do?" SOMETIMES it works like that, but most of the time we have to take some action. We have to really study out our decisions, make some plans, and sometimes we even have to make a decision. And when we make that decision, we can come back and ask Heavenly Father if that decision was the right one. Heavenly Father won't withold answers and guidance from us, but He likes to see that we are willing and ready to try! The quote of this week comes from a wonderful phone call we had the other night. We've been trying to contact some less-actives our area, but unfortunately we didn't have the right phone number for one of them. When we tried calling, a random man picked up the phone. My companion, chi Thu Hong, being the awesome missionary that she is, immediately started talking to him about the church and asked if he wanted to come to an activity with us. His response? "Umm.. Sẽ có đậu hủ ở đó không?" (Translation: will there be tofu?) Turns out he was buddhist and a vegetarian. But regardless. If you ever have to decide whether or not to go to an activity when random strangers invite you through the phone, just ask them if they'll have tofu there. That will help you make up your mind. Thanks for all the emails, updates, and PICTURES (thanks Elder Duffy for all the pictures you just sent). Have a good week! Celebrating our 16 months in the mission and Sister Nelson's 1st month. It's been 4 days since we moved houses to District 6. I'm currently typing on a keyboard that flashes rainbow lights everytime I hit a key. The faster I type the more it flashes. I think I might have a seizure after this email. "And Satan had hope to shake Kim Thu from the faith, notwithstanding the many miracles and experiences which she had seen concerning whitewashing a new area; for she truly had seen angels, and they had ministered unto her. And also, she had heard the voice of the Lord speaking unto her in very word, from time to time; wherefore, she could not be shaken." (Jacob 7:5, except for my name isn't actually in there). There's been a few moments when I've felt a little panicky because our lack of investigators, or all the work that has to be done. But then I remember, "Oh wait, Heavenly Father already gave me this trial, and last time it was 10x harder because I didn't know what I was doing. If I did it last time, I can do it again." Sometimes are trials feel way hard and we just want to get rid of them as soon as possible, but after we get through them, we have all this new experience and knowledge. (Example, I just realized that I used the word "Are" instead of "our".. Typing is now a trial in my life, please excuse my bad grammar.) And then, in the future, when we meet another trial, we'll be able to use that past experience to get through it more easily. So trials really are blessings. Hard blessings that sometimes we don't want, but still blessings. The branch here in District 6 is so tiny, it's adorable! There were probably 30 people that came to church, including us 7 missionaries. There is so much work to do, but it's great. The members here are awesome and so fun to talk to, so I'm really excited to be serving here. The food has been great, the weather has been incredibly hot, and there are probably more mosquitos here than I've ever seen in my life. But life is good. The quote for this week, of course, comes from our adorable chi My: "Chú, bao nhiêu tiền." (Hey you, how much money). We went and ate pho the other night (chi my's first time!!) and chi My wanted to ask the owner for the bill, and she did! We haven't quite gotten down a more polite way to ask for the bill, but at least she did it! Hahaha, chi my is absolutely ADORABLE and is so willing to try everything, even if she doesn't really know what she's doing! Plus we have some chinese neighbors in our new apartment, and she was able to talk to them a little bit. Go chi My!! Or in the words of one of the members here, Go Sister America!! Thanks for all the updates and pictures, I love hearing from you all! Have a good week! I'm off to Quan 6! We got our transfer calls last night, and I'll be serving with chi Thu Hong (AGAIN!!!!) in Quan 6. We'll be training a new missionary together until the 26th of September, and then at that point we'll get a different transfer call to see who will be moving to a different area to train someone else. I'm going to miss the investigators of Tan Son Nhat, and all the members too, but I am excited to see what quan 6 is like. I also feel bad for whoever will get both me and chi Thu Hong as co-trainers.. We'll probably go crazy. This past week was a good one. Very tiring, but a good week. Our investigator, Co Huong, was back at it again with the random post-lesson comments. This week, after we ended the lesson, she said: "Want to know one of the foods that I learned to love in America? OATMEAL. MMM so good! That is why the Lord wants us to follow the word of wisdom and eat grains. because OATMEAL." She is so stinking cute. I'm going to miss them so much! But lucky me - their baptism day is the day of district conference, so I'll be able to attend and see them get baptized! Our other star investigator, chi Van, has hit a different kind of problem.. She's ran out of stuff to read! We try to get her some good reading commitments so that she's learning new things, but she's almost done with the Book of Mormom already! She's also read the entire Gospel Principles book.. So we are just about out of ideas! Church yesterday was such a great time. One of the members in the branch just had her 3rd child, and yesterday the father was able to give the baby a baby blessing! It was such a great experience because those don't happen very often here in Vietnam! To have a whole family in the church, have children born into the covenant, is such a miracle. It was such a great blessing! Well, Wednesday night we get to meet our new companions. 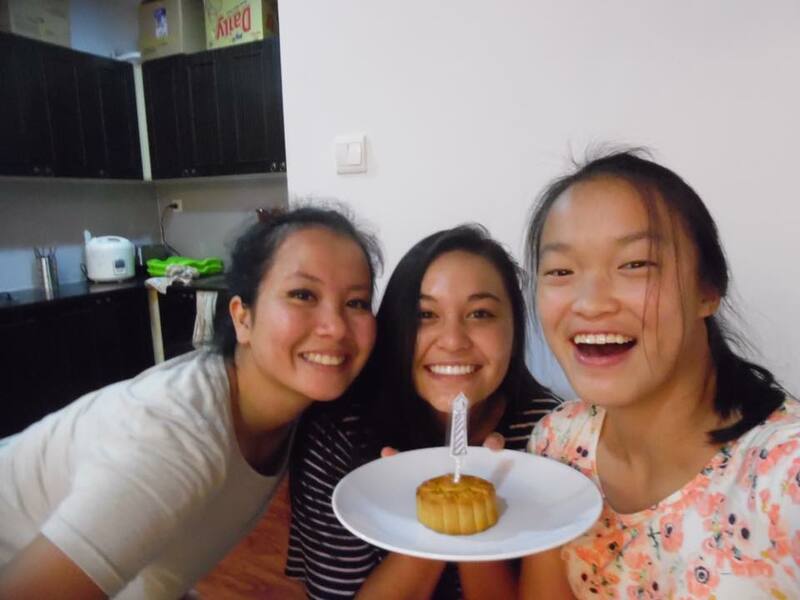 Our two roommates, chi Tam and Thuy Anh, are both getting sent to Long Bien (that's in Hanoi) so now there will only be 2 sisters living in this current apartment. What does that mean? Freedom. We are going to deep clean the whole apartment and rearrange everything. Well, the next time you hear from me I'll be in Quan 6. I hope everyone has a good week! Yesterday at church, our investigator stood up and shared everything there is to know about Tuberculosis (there's been a mini outbreak, but nothing to be worried about). When she was asked, "How best can we strengthen our immune system so that we don't get TB?" She responded, "Lời Thông Sáng của Chúa đó!!" Which basically translates into, "The Lord's Word of Wisdom! DUH!" You go, girl. We haven't even taught about the word of wisdom yet. I love her so much. Other progress with our wonderful investigators: We taught Co Huong and Chi Thanh about temples the other day, and as always, Co Huong gave one of the best comments after the lesson: "Chúng ta không cần đợi để lên thiên đàng. Chúng ta chỉ cần đi Salt Lake City, Utah và đi vào những đền thờ ở đó, đi lên phòng thượng thiên. Mình ở thiên đàng rồi." (We don't need to wait to get to paradise, let's just go to Salt Lake City and visit all the temples there and go into the Celestial Room. That's paradise already.) She's the best. Well, thanks for all the updates, emails, pictures. Have a great week! This is the main reason why I love Vietnam: they have all the correct facts about ice cream. That was hands down the greatest thing that happened this past week. 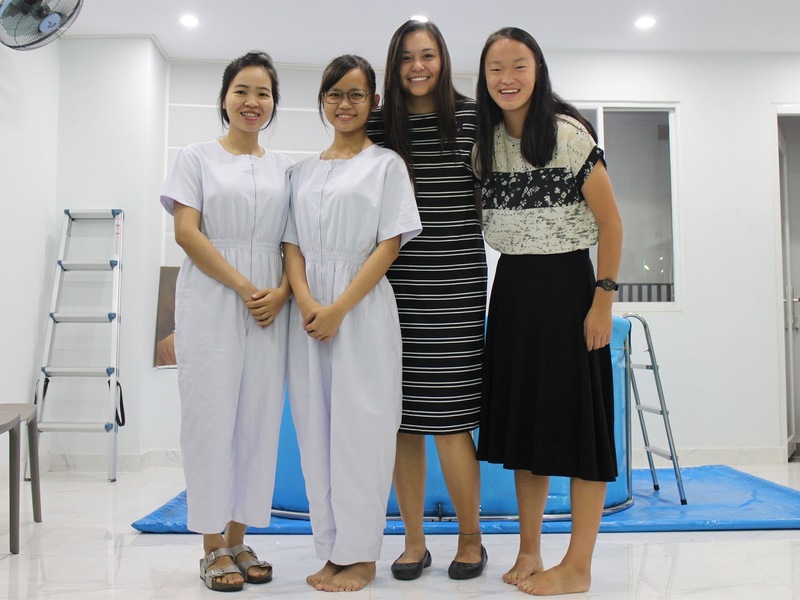 Tinh has waited so long to be baptized and the day ended up being so special and wonderful. Chi Chau and I got to the church early to help her change clothes and what not. We gave her a present and I think she was so full of joy that she was about to explode. I love chi Tinh so much - she is the cutest person I have ever met, and she has such a strong testimony of Christ and the church. So what else happened this week besides the most wonderful baptism of all time? Our roommate, chi Thuy Anh, brought a durian home. While I was getting ready one day, trying not to breath too much because the smell of durian is intoxicating, I came up with a pretty good analogy for it. Durian is a lot like sins. Sometimes we deliberately bring a durian into our home - we go out an buy it ourselves - and sometimes we accidentally bring a durian into our home against our original intentions - someone gives us a durian when contacting at an outside market. It doesn't matter what happens, but now all of the sudden you have a durian in your home. And what's wrong with durian? From first glance, there's nothing wrong with it. It's just a fruit. But then as time goes on, it starts to smell. And let me tell you from first hand experience, when it smells, it SMELLS. It takes over everything else in your whole house and eventually you can't focus on anything else because it smells so bad. Some people can battle through the smell - they just put up with it and hope that everything will fix itself. But, again, let me tell you from first hand experience, the smell will not fix itself. Every day it just gets worse and worse and then you really start to regret your decision to bring the durian into your house. So what can you do? Here's what you do: put the durian in a plastic bag, stick it in the garbage, and then throw the garbage out in the main dumpster. And decide to never, ever, EVER, bring a durian into your home again. Let's relate this to sins: Sometimes we diliberately sin - we do something that we know wasn't right but at the moment we just didn't care or got carried away. And sometimes, we sin on accident - we had no intention of doing it, it just happened. But whatever happens, we've sinned. We've done something that we knew wasn't the best thing to do, but it's happened, and you can't go back and change it. So what's wrong with that? From first glance, it was just a mistake. No one really got hurt, no one needs to know. It's just a sin. But then as time goes on, it starts to take its toll on us. We start feeling guilty, self-conscious, like all of the sudden everyone knows about what we did and they're going to judge us. Or maybe it has a different effect - we start feeling unworthy, like what we did was the worst thing in the world and there's no coming back from it. Sometimes we'll try to battle through these sins without having to repent - we just put up with it and hope that everything will fix itself. "It'll go away if you don't pay attention to it". But every day we'll just feel worse and worse and then we really start to regret our decision. So what can we do? Here's what we do: repent. Pray to God and ask for His forgiveness, and just as important, ask for His help. Heavenly Father wants us to become like Him, and He doesn't have any sins. We're not perfect, so of course we're going to mess up every once in a while. We'll say we won't do things any more but then life happens and we've messed up again. Heavenly Father knows that will happen. However, His expectations of us don't change. And because His expectations don't change, He will be there to help us. How unfair would it be if your chemistry teacher told you that there would be a huge test at the end of the year and that everyone is expected to pass, but then never showed up to class to actually teach anything? Very unfair. Heavenly Father is not unfair - He will guide us every step of the way, give us the strength to change so that we can meet His expectations. He loves us for more than just who we are - He loves us for who we are trying to become, and He loves us for just trying. My advice for this week/forever? Put that sin in a plastic bag, throw it in the garbage, and then throw the garbage out into the main dumpster. Then rely on Heavenly Father to help you do better next time. Also, never buy durian. Of course this analogy doesn't work if you actually LIKE durian. So if you do, please disregard this email. Thanks to everyone for the emails and pictures and everything! How to transport fresh veggies.